The MoC added that this cooperation is also a gift from the Central Government to the Province of East Java on the 72nd anniversary of the Republic of Indonesia’s Independence. Furthermore, the Minister of Transportation said that there are still 28 ports and airports that will be handed over to operators for cooperation. It aims to reduce the APBN budget annually. “I still have another 28 ports and airports that will be operated in cooperation with SOE, BUMD and private operators. Pray this process can be quickly completed so that the state budget is light because later we (the government) will as a regulator and operators are state-owned enterprises, enterprises and private. We want the operator to work better because we will spur with a regulation and those who carry out the activities, “said Minister of Transportation. Going forward with such a partnership could at least reduce logistics costs by 20% and increase port services by 30%. “So in and out of goods no longer by land but by sea,” said Minister of Transportation. 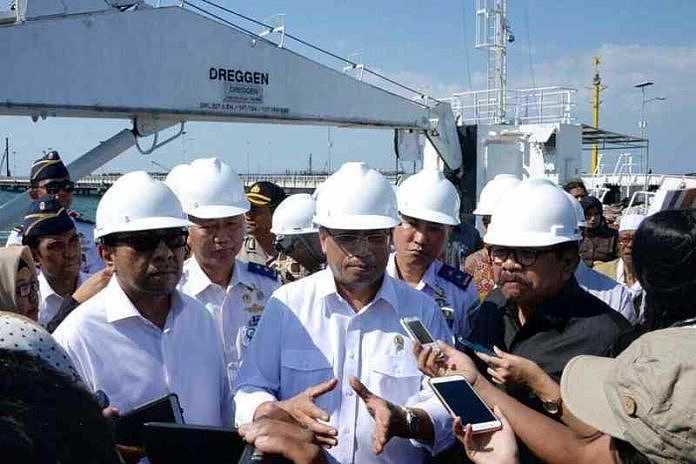 In line with the Minister of Transportation, East Java Governor Soekarwo said the three points better, cheaper and faster is a conclusion of competitiveness. “We were asked by him (Menhub) to improve port competitiveness. We are ready because the basic principle that the trust we do to make this item faster delivery process, the cost is cheaper and the service is better, “explained Soekarwo. On the same occasion, Elvyn G Masassya thanked Kemenhub who has realized the cooperation plan to utilize port management to PT.Pelindo II in West Kalimantan. “PT. Pelindo II is grateful to the Ministry of Transportation especially the MoC which has realized the cooperation plan because this concrete form we together can lower the logistics cost especially in West Kalimantan and this is the beginning to later manage another port which I think is now being reviewed by Kemenhub, “Explained Elvyn. Elvyn also added that this cooperation is also a clear proof that between regulators and operators can work closely together to support Government programs especially in lowering logistics costs.